As we celebrate the success of community businesses this week and mark the opening of our new £10 million fund to support them, we are sharing blogs from some of our grantees. 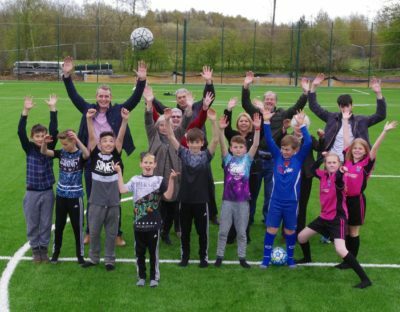 Steph Hryschko, Chair of Kiveton Park and Wales Community Develop Trust, tells us how a mining community came together to create a sports facility to improve the health and wellbeing of local people. Kiveton Park and Wales Community Development Trust established in 1997 following the closure of Kiveton Colliery. The mission was to “breathe new life” into a devastated community. Back then we couldn’t imagine what the future would look like. Mining communities are renowned for community spirit and pulling together. Now almost 20 years on there is still a resilience and determination to stand up for better standards, be it in housing, health, environment or education and job opportunities. As volunteers we may not have the best business skills set (and some would say “if they can do it anyone can! !”) but we are all local and no one knows better what the community needs or is more willing to work for it. Three years ago we got ownership of the Old Colliery Offices and seven acres of surrounding land. The community were quite clear about what they wanted to develop on the land – a multi-sport facility for all ages and abilities. Market research backed up that this would have great business potential and so our journey began. Power to Change funding was such a perfect match to our project aspirations and we still have to pinch ourselves to believe we got it. A local resident working in the steel industry for Harsco Steels got involved and matched our funding with £200,000 of in kind materials such as steelphalt for the parking areas and roadway. We now know so much about astro-turf, flood lighting, drainage and fencing that I think we could have another business in consultancy! The building work has moved on at a fantastic pace and on 15th May we will have a great celebratory opening event. This is an amazing facility we are all immensely proud of. There is such an excitement and buzz about this in the community. It will create apprenticeships, jobs and contribute to the health and wellbeing of our community for generations to come. Find out more about the Kiveton Park and Wales community sports centre.